The officer who was with Constable Stephen Carroll the day he was murdered in Craigavon recalls his colleague nine years after his death. He recalls the events leading up to the attack in Lismore Manor on March 9 2009. And he describes how he will never forget his friend, and the family robbed of a husband, son, brother, grandfather as well as a unit robbed of a friend and colleague. 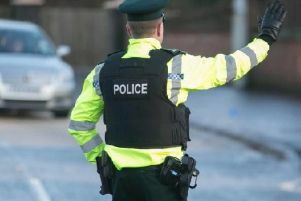 Speaking on the PSNI Craigavon Facebook page he said: “At 21:45 on 9th March 2009, two police cars attended to a call at Lismore Manor in Craigavon. “A young woman, her children tucked into bed, was sitting in her home when a brick was thrown through the living room window. “This, it transpired, a deliberate act to lure police into the area. As anyone would, the householder phoned 999. “The officers attending knew of an increased threat of an attack in this specific area. More so given the cowardly murder of two young off duty, unarmed soldiers less than 48 hours earlier. “They attended this call for help regardless. “The first car went to the house. As the second car made to turn in the small cul-de-sac, a burst of automatic gunfire struck the vehicle, fatally wounding my driver, Stephen Carroll. The vermin who carried out this act quickly skulked off into the darkness, their evil deed done. “A family robbed of a husband, a son, a brother, a father, a grandfather. A unit robbed of a friend and colleague. Our community robbed of an honest, decent and diligent peeler. “Nine years gone, always remembered. Another police officer based in Craigavon said: “I had applied for the PSNI less than a month before Stevie was murdered. I remember the news that night, and my mum looking at me with fear in her eyes, squeezing my hand, yet saying nothing as she knew it was what I was determined to do. “This day 9 years ago, that determination to give back to the community deepened. Every year we remember him, his sacrifice, and renew our determination to work as hard as we can to honour his memory in the best way possible- by keeping our community safe.